This is a fun Halloween activity for a rainy day. 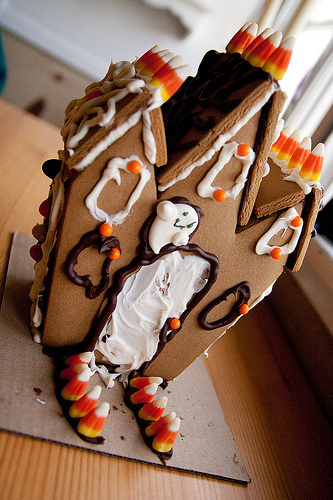 Kids will love making their own scary gingerbread house! Preheat oven to 350 degrees and line baking sheets with parchment paper, set aside. In a large bowl cream the butter, sugar and molasses until creamy. Add in the egg. In a medium bowl add the flour, baking soda and spices. Whisk together until incorporated. Slowly add the dry ingredients into the wet and mix until dough is stiff and the flour is all combined. Cut dough in 1/2 and begin to roll out on floured surface. Cut the dough into desired shapes for your house (you don't have to get fancy here, just make sure you have pieces for a roof, 2 sides and front and back). Place pieces on prepared baking sheets and bake about 10 minutes or until golden. Allow to cool completely. Meanwhile, mix your icing. Beat all ingredients together until stiff peaks form. Keep covered with a moist towel until ready to use.